Young defender Adam Oxley won a career-high 33 disposals in Saturday's loss to Adelaide. Collingwood Media has published the key statistics from the club's 27-point loss to Adelaide at Etihad Stadium on Saturday evening. 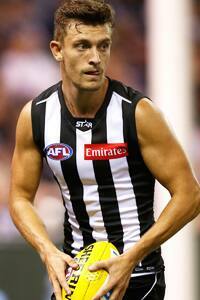 Young Magpie Adam Oxley led the way in a career-best display that saw him collect 33 disposals. It was the first time he had not been employed as a substitute in any capacity. VOTE: Choose your 3-2-1 from Saturday's match in the Magpie Army Player of the Year Award. K: Kicks, H: Handballs, D: Disposals, M: Marks, HO: Hitouts, FF: Free Kicks For, FA: Free Kicks Against, T: Tackles, G: Goals, B: Behinds. VIDEO: "We didn't use it well enough," - Buckley.